Anne Hathaway chopped off all her hair, joining the pixie likes of Michelle Williams and Emma Watson. It’s a slow day for news, and a Sunday (clearly I write all my articles the day before, that’s why they all seem outdated) so give me a break. 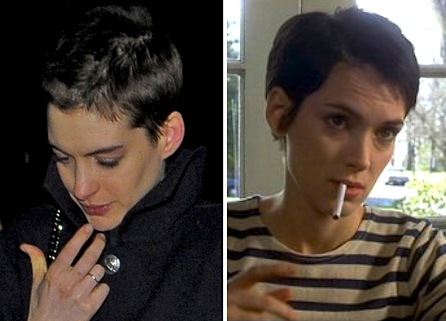 I think she looks a tad like Winona Ryder. Well, less cool. To be fair, no one is/was as cool as Winona Ryder or Juliette Lewis. 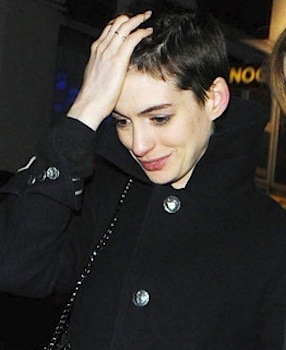 Hathaway reportedly cut her hair to prepare for her role as Fantine in Les Miserables. The Les Mis prostitute thing was done by Uma Thurman in 1998 (I used to rent it from the library all the time) and I’m thinking that Tom Hooper’s 2012 adaptation will simply have a bigger budget and not much else. Amanda Seyfriend, Hugh Jackman, Sacha Baron Cohen, Helena Bonham Carter and Russell Crowe are all big names but how well can this possibly do? My generation is too impatient, too busy playing Temple Run. It is just for a role people calm down! Actors do this all the time, it doesn’t look that bad either.